Japan solved one of the world’s most pressing problems: nagging selfie arm. The Huffington Post reports the country that gave us Ichiro Suzuki and an irrational fear of six-story lizards is also giving us a ridiculous novelty we will assume takes over the world like boy-band haircuts. The item in question is a selfie stand, which is fantastic for taking selfies but horrible at acting like what really is, which is just a really tiny table. Hopefully Japan will next solve how to get the tangle out of iPhone ear buds taken out of your pocket or perhaps create clean renewable energy. Fingers crossed on the ear buds though. As best we can tell, the selfie stand is kind of like the ledge or table you used to use to snap off a picture, only with a far better PR team behind it. Rather than extend your arm, you can now set the timer and take a picture the way it was intended—albeit with the usual complement of awkward grins, cargo shorts and fedora hats. 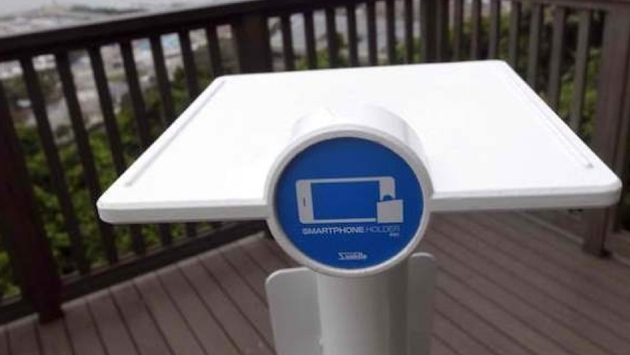 All snark aside, this does allow you to take a picture without having to bother a stranger to take a photo, because the longer you can vacation without human contact the better. Right? Either way, please don’t congratulate Sunpole, a company that really just produced a table, which we believe was already invented. This is essentially the same as me trying to milk some kudos from the drawings I did as a kid. As for me, I will be looking for a selfie stand, which I will then include in the background of my selfie picture, hopefully causing some sort of sci-fi paradox that will cause the end of all humanity and/or selfies. Fingers still crossed on those damn tangled wires though.